Spicy and tasty chicken snack for any occasion. 1. Mix the mustard powder, red chilli powder, garlic, salt and pepper in a bowl. 2. Add the chicken pieces and blend until evenly coated. 3. Heat oil in a deep frying pan over medium flame. 4. Dip the chicken fingers in the maida and then in the egg. 5. Dredge them in corn flour and fry till golden brown and crisp. 6. Turn them once or twice. 7. Remove and drain excess oil. 8. Serve hot with ketchup, mayonnaise or mint chutney. 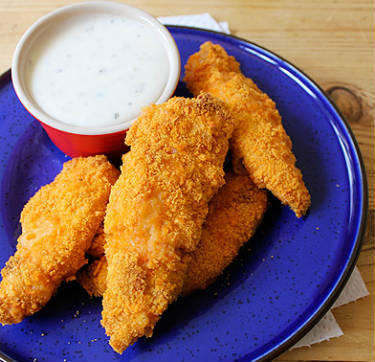 Feel free to comment or share your thoughts on this Spicy Chicken Fingers Recipe from Awesome Cuisine.